Do you know that Access Bank mobile money transfer code makes it easy to perform any transaction via SMS or USSD right from home or anywhere you are. It works on any type of phone; be it Android, IOS, Symbian or Java phones. 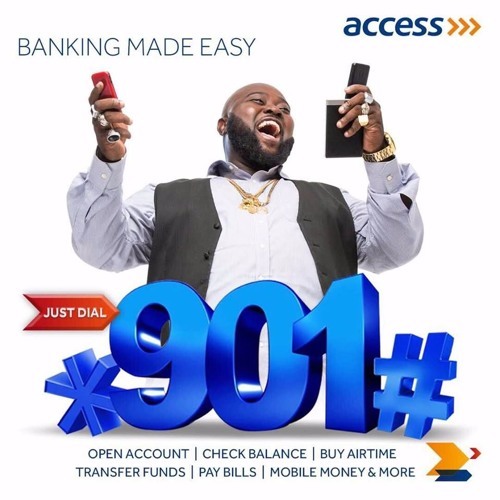 With Access Bank mobile money transfer code various transactions like airtime recharge, money transfer, check account balance, bills payment, BVN and email update can be carried out on your phone without the internet. With Access Bank Instant Banking you can perform a maximum transaction of N100,000 daily from your phone. Airtime purchase limit is N20,000 daily. First, you have to register for USSD banking by dialling *901# on your mobile phone. You will be prompted to enter your BVN number to complete the registration. If you want to transfer money to an access bank account, dial *901*1*AMOUNT*NUBAN Account Number# and authorize with the last 4-digits of your BVN number. If you want to money to other banks, dial *901*2*AMOUNT*NUBAN Account Number#. If you want to recharge your phone with airtime, simply dial *901*Amount# – for example if you want to recharge N1000, dial *770*1000# and send. If you want to recharge other people with airtime or other phone numbers, dial *901*Amount*Mobile Number#. If you want to check your account balance, just dial *901*5# and provide the last 4-digits of your BVN number to authorize it. If you want to carry out more transactions, kindly dial *901# and you will be presented with a menu to choose what you want to do. NOTE: This service is available to all Access bank account holders. For you to able to use this service, you must have a BVN number and a phone number registered with the bank. This Service is available to MTN, Glo, 9mobile and Airtel subscribers.This service is also available to use 24 hours every day.